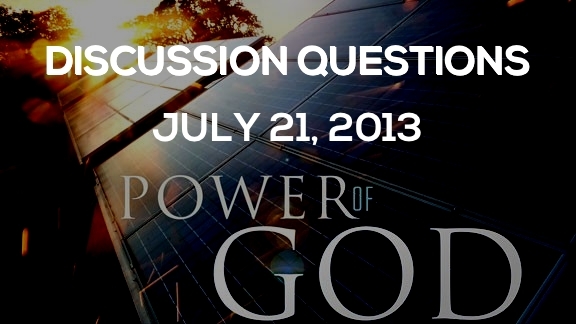 The following discussion questions are meant to supplement week 2 of our Power of God series; The Power of Love. We encourage you to discuss these questions with your family and/or community group. Please leave a comment below if you have feedback or questions on anything mentioned in this weeks sermon. 1. Take the time as a group to review the memory verses from the 9 Week Challenge. How can you encourage one another this week to memorize and apply these verses? 2. Review John 13:34-35. What is to distinguish the people of God? How have you seen those in your group effectively love others outside of your group? How can you better love one another during this particular season in your lives? 3. How do you define love? How does the world’s definition of love differ from the biblical definition of love? 4. Read 1 Timothy 1:5. What is the “goal” of God’s instruction to us? What does it mean to love with a “pure heart” and a “good conscience”? A “sincere faith”? 5. Read Matthew 22:37-38. How does Jesus summarize the law? What do you think it looks like to love the Lord with all your heart and soul? Your mind? How are we to love our neighbors? What inhibits us from loving our neighbors as we love ourselves? 6. Busyness, fear and a heart clouded with sin prevent are a few of the reasons why we fail to love others. What are some other reasons why we fail to love others. 7. Identify your neighbors. How can you love your neighbors more “loudly” and “legitimately” as JP challenged us? Assess their needs, look to meet their needs and attach truth to it. The post Discussion Questions: July 21, 2013 appeared first on Watermark Community Church Blog.